Well they are finally here. After months of asking 'SmartWater' where are the AD Campaign 2015 for 'Jennifer Aniston' here they are. Jennifer Aniston is course looking beautiful in this ads. 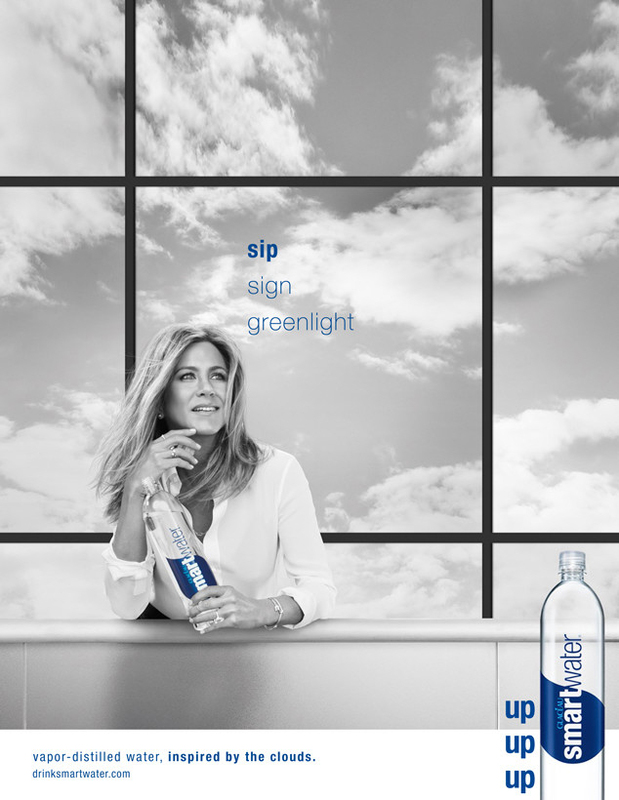 Jennifer Aniston has been the face of 'SmartWater' brand for the past eight years. Jennifer Aniston also did a interview with Elle.com about her beauty regimen and her favorite meals and of course 'Justin Theroux'. Her favorite smells: “I love the smell of coffee, coffee beans, the ocean, ocean air, mornings when I go out and walk my dogs. Freshly cut green grass. I wear the fragrance that I made. Haircare: “Living Proof is just a perfect product and they’ve just come out with a humidity shield, and for me it’s incredible. Also the Night Cap, that is something that you put on at night or just around the house, it smells so good. You put it in your hair and it absorbs it. And the new Blowout which you spray in right before you blow dry. It has UV protection and chlorine protection. I do my color once a month, just a touch-up every four weeks. But I’m trying not to color it right now and give it a break. Using Aveeno on long Flights: “I do take my makeup off. There are great makeup removers from Aveeno, so you just wipe it off. And a little spray bottle of Evian, and wipe your face down with a toner, and put on your moisturizer, and do a mask, especially on a European Flight. I’m a lip balm and eye drops addict. I have terrible allergies. I use Alcon Naphcon A. I really enjoy the sensation of eyes burning. Dr. Hauschka great lip balm and By Terry Rose Balm in the pot it’s really gooey for bee stung lips. Worst Look: “Bleach out my eyebrows, I will never do that again. It was my first Cosmopolitan cover and Kevyn Aucoin was doing my makeup, and all of a sudden I had white foam on my eyebrows. It was a real look in the 90s, and it looks gorgeous if you’re Linda Evangelista. I was so new and naïve in the business, I didn’t know that I could say ‘no.’ I had to paint in my eyebrows for three months with brown shadow. On Justin’s beauty products: “We share everything. He uses all Living Proof and Aveeno Daily Moisturizing Lotion. Guys are lazy. They use what’s in front of them. He has his own toothbrush, of course, and in an emergency then we’ll share. I like my toothbrush. 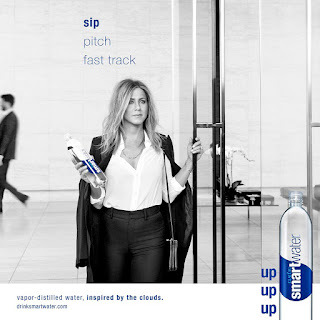 I know that i started drinking SmartWater just because of Jennifer Aniston. But i do have to say that it does really taste better than all the other waters i have tried before. It taste much cleaner if that makes sense.